US, 1980, 100 minutes, Colour. Colleen Dewhurst, Warren Oates, Paul Mc Crane. And Baby Comes Home is a sequel to the very popular telemovie And Baby Makes Six. It reunites the director Waris Hussein and most of the cast. The film has a great deal of feeling ? for the value of life, for young life as well as for people growing middle-aged and old. 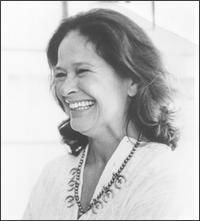 The film is a star vehicle for Colleen Dewhurst who gives a very strong performance as the middle-aged mother going through crises before turning 48. She receives warm support from Warren Oates. There is an exaggerated character, Robert, played with some sympathy by Paul Mc Crane (Fame, The Hotel New Hampshire). While the material is familiar from television, the treatment has more strength than usual. An interesting and valuable popular picture of human life. 1. Interest in the film in itself? As a sequel? Entertaining? Themes of family, middle age, crises? 2. The impact of the film as a telemovie - for the home audience, geared for home viewing and attention? The importance of these human themes for popular audiences? 3. The film's presupposing the original film, the pregnancy and its implications for the family? The experience of a family, pregnancy, birth, the impact of a baby in a family, for parents facing middle age and coping with adolescent children as well as adult children? Themes of expectations, suicide? 4. The focus on the birth: the preliminaries, the fuss, the experience of the birth, the presence of Michael, wonder? Problems? The role of middle-age parents as mother and father of a young baby? The implications for the rest of the family? For Anna's mother? The hospital sequences, the home sequences? 5. The focus on baby Sarah, joy, care and feeding, the focus of home life, burden, the care given by the grandmother, despite herself? The pro-life stances of the film? 6. The sketch of the family and its growing up - the young son and his dropping out, being involved in social work and care? Jason and his wanting to work on film, the exams, the failure, absorption in his own life, running away? The friendship with Bob? The suicide attempt and his trying to help him? Elizabeth and her husband, the focus on career, money? with Bob, talking with him, listening to him? The crisis? Her going out of the house, the importance of her pleading with him, offering love, success? The problem of turning 48, avoiding it, finally facing it? 8. Michael and his support, love, place in the family, playing music, the weekend with his wife, beginning to be tense, not understanding her, the encounter with the woman at the bar? His own coping with middle age? 9. Anna's mother and her career, not wanting to baby-sit Sarah, her daughter pleading with her, her mellowing? A reserved woman and the difficulty of showing affection? 10. Themes of age, facing up to middle age, acceptance? Physical crises, psychological crises? 11. The subplot of Bobby and his marks, family, friendship with Jason, clashes, melodrama, visits to Anna, the attempted suicide, a long sequence (in proportion to the rest of the film? ), Anna's response? 12. A piece of popular Americana reflecting themes and interests of the 80s?